While completing my dietetic internship twenty years ago (wow!! ), I had a rotation through the diabetes treatment center. My preceptor told us, “We do not call people diabetics, they are people with diabetes.” That resonated with me. Over the years as a dietitian, I have been careful not to label people by their medical issues. Two weeks ago today, I had an endoscopy and colonoscopy. The next day, our family welcomed two new foster kids into our home. Two days after that, I received the pathology report: it was positive for celiac disease. Get my primary and secondary relatives tested for celiac disease. Educate my family on what a gluten-free diet looks like in real life. A dear friend who has a child with celiac disease recently asked, “How are you going to arrange your kitchen?” I answered, “I’m just trying to survive right now. 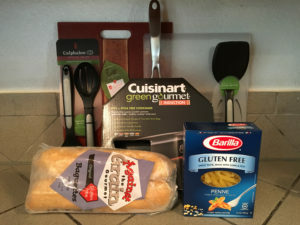 I haven’t had a chance to clean out my kitchen yet.” Last night, that same friend dropped off a goodie bag filled with new kitchen utensils, cutting boards, a pan, and two favorite gluten-free food items. What a thoughtful gift! Training for the September Tunnel Light Marathon has begun. One of the reasons for getting tested for celiac disease was the incredible fatigue I felt when training for my last marathon. Today I didn’t feel exhausted during my run. I had more energy, and ran almost 30 seconds per mile faster than last week. Maybe it’s placebo effect, or maybe my body is starting to heal after removing gluten. I’m looking forward to having a healthier body, and maybe even a faster marathon time! I am not a “celiac”, I am a person with celiac disease. CeliacNow.org Beth Israel Deaconess Medical Center, a teaching hospital of Harvard Medical School. This website is for people who may not have access to specialized nutrition care for Celiac Disease. http://americanceliac.org/celiac-disease/ The American Celiac Disease Alliance (ACDA) is a national non-profit advocacy organization representing the celiac community and those dedicated to improving the lives of those with celiac disease. celiac.org Celiac Disease Foundation (CDF) provides support, information and assistance to people affected by CD & DH. celiaccentral.org National Foundation for Celiac Awareness (NFCA), a non-profit organization dedicated to raising awareness and funding for celiac disease that will advance research, education and screening amongst medical professionals, children and adults. celiac.com Offers key GF and wheat-free online resources that are helpful to anyone with special dietary needs. beyondceliac.org/ Advances widespread understanding of celiac disease as a serious genetic autoimmune condition and works to secure early diagnosis and effective management.